With some dystopian themes taking hold in our everyday reality and the success of Handmaid's Tale TV series, it may seem like a good time for HBO to revisit other classics of dystopian science fiction. 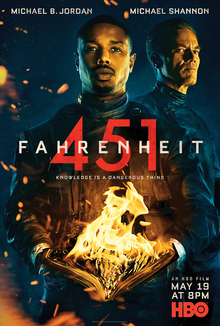 This year, they released a new movie adaptation of Ray Bradbury's Fahrenheit 451 – the novel about firemen burning books because different opinions and worldviews create unhappiness, and about literati rebels fight back by the way of illicit bookcrossing and memorizing whole novels. The story is recognizable for the fans of the novel, I guess, even though writer-director Ramin Bahrani (together with his co-writer Amir Naderi who is an established director in his own right) has played around with the characters and events quite a bit. There's a lot to modernize in a novel that is a 65 years old speculative future, of course, but I wouldn't describe much of it as very successful. There are new books to fight about, for sure: We see the book-torching firemen burn a copy of a Harry Potter novel and Clarisse McClellan – transformed from the teenage neighbor appearing in Bradbury's novel into a fire brigade's unwilling informer and eventually the protagonist's love interest – is memorizing Zadie Smith's White Teeth. Instead of soap opera parlor walls (or whatever it was everyone was addicted to in the novel) the citizens of this new world seem to be obsessively consuming reality TV broadcasts of raids by the firemen. It is never explained and it has no consequence for the story, but all the emoticons and comments appearing on the building-size displays suggest some kind of social media aspect to this technology, even though everything and everyone seems to be firmly under the bootheels of their paramilitary rulers. Any amount of free expression is hard to reconcile with the vision, so the world starts to come apart at the seams if you consider it too closely. Some hard drives get torched with the books and there are computers and networks around but the rebels mostly stick to reading and smuggling dead-tree editions which seems a bit unpractical. The main character is still Guy Montag (played by Michael B. Jordan) from the novel, a fireman who starts having second thoughts about what he's doing, but Bahrani has completely dropped his wife to make room for Montag's romance with McClellan. As a consequence, the film doesn't have a person who would stay desensitized by the stale state-approved entertainment as a contrast to Montag who has woken up. That's perhaps one of the biggest things making the film less engaging. Showing us only the conflict between firemen and their opponents leave much of this dystopian world unexplored. Of course, there's only so much the film can do, given its source material. Fahrenheit 451 is ultimately making a philosophical armchair argument, and transforming that into high-adrenaline political action was never an easy task. For anybody living in 2018, banning fiction as a way to lessen tensions between different worldviews is as nonsensical a proposition as it gets, because practically all other imaginable kinds of human interactions (social media, journalism etc) are much more effective in polarizing societies around the world today. Perhaps this would have been an interesting theme to look into in the movie adaptation, and quite possibly something that Bradbury would be thinking about if he was writing Fahrenheit 451 today. The haunting character of fire brigade captain Beatty played by Michael Shannon, the musical-esque opening scene in which firemen sing in their fire truck, and occasional cool visuals are about the only solid things about this movie. In addition, the ending is your cup of tea if you enjoy over-the-top poetic and metaphoric moments and can manage to suspend your disbelief in the book-loving rebels' arguably rather silly master plan. Bonuses: +1 for "Down the red-hot valley, lo! The phantom armies marching go! Salamander ho! Salamander ho!" Nerd Coefficient: 3/10 – "Very little good I can say about this"